The keel for the Queen Elizabeth 2 was laid down at the John Brown and Company Ship Yards on July 2, 1965 and she was launched into the river Clyde on September 20, 1967. Over the next four years the new Cunarder would be fitted out. 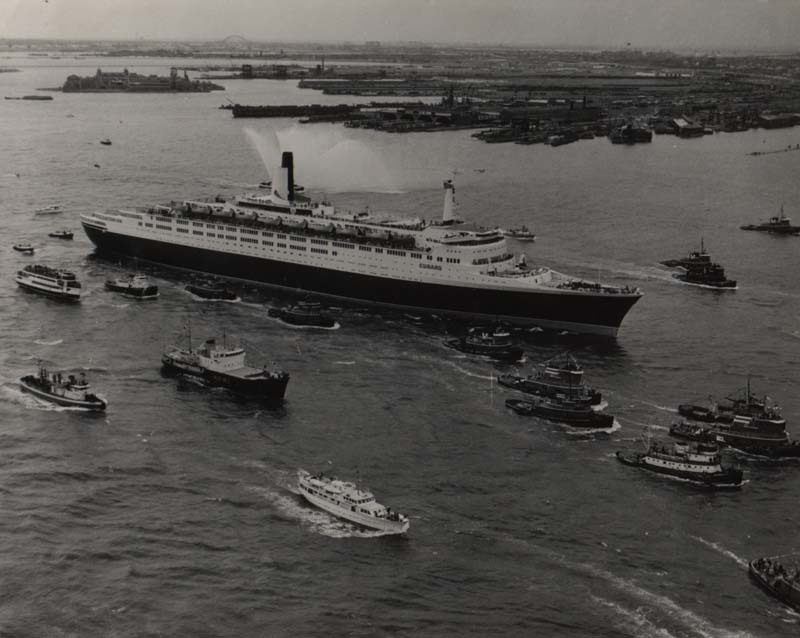 The QE2 as she would become known would sail from Southampton, England on her maiden voyage to New York on May 2, 1969. In January 1972 the QE2 would come to the aid of the fire stricken French Lines liner S.S. Antilles and would take onboard more than 300 stranded passengers. 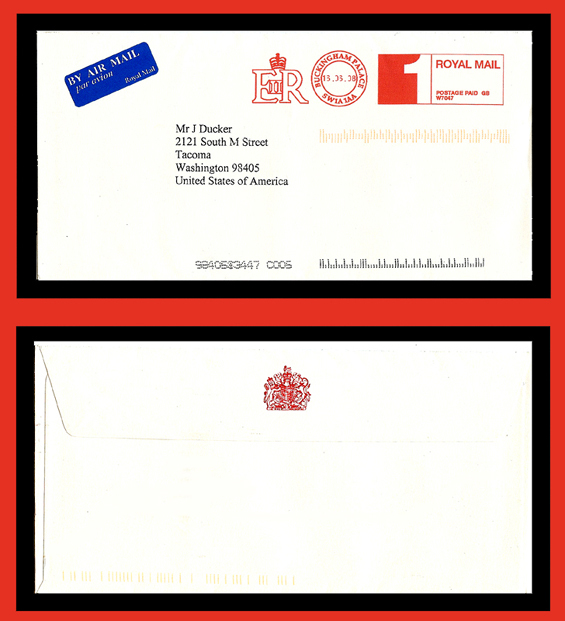 Only four months later in May 1972 the Cunard New York office received a telephone bomb threat. British military parachutist where dropped into the Atlantic and brought onboard to conduct a search. The threat turned out to be a hoax. The QUEEN ELIZABETH 2 would make her first around the world cruise in 1975 and pass through the Panama Canal on March 25, 1975. 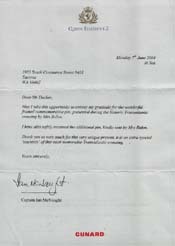 May and June 1982 saw the QUEEN being used as a troop ship after being requisitioned for the Falkland Islands War. On May 12, 1982 she would sail from Southampton with 3000 troops onboard. 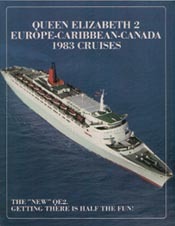 QE2 returned to Southampton on June 11, 1982. After a refit she would return to service in August sporting a new pebble gray hull color and the traditional Cunard red and black funnel colors. By July 1983 her black hull would return. The QE2 would go to the Hapag-Lloyd yards in Bremerhaven, Germany in October 1986 for conversion from steam to diesel engines. Her slender funnel was also replaced with a larger and more robust funnel. The QE2 would encounter Hurricane Luis during her September 1995 westbound Atlantic crossing and was hit with a 95 foot wave. On January 2, 1996 the QE2 would sail past the four-million miles and by August 29, 2002 would complete over five-million miles sailed. 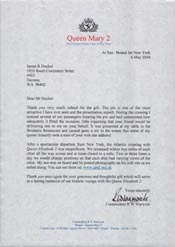 The QUEEN ELIZABETH 2 and QUEEN MARY 2 would meet in New York for the first time on April 25, 2004. The two ships would set sail that night; QM2 would depart first followed minutes later by the QE2. This tandem sailing would be a first time ever two Cunard Queens sailed across the Atlantic together. The two ships sailed within sight of each other and two to three times a day would change positions giving everyone onboard a view. Upon arrival in Southampton on May 1 the Boston Cup was handed over to Commodore Warwick and now sails on the new flagship of the Cunard fleet, QM2. The Boston Cup was a gift given to Samuel Cunard by the citizens of Boston, Massachusetts after the completion of the first regular transatlantic crossing by the Britannia in 1840. This would be the QUEEN ELIZABETH 2s last regularly scheduled transatlantic crossing and would mark the end of an era for the QE2. 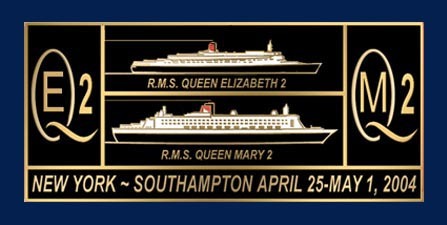 On the morning of May 2, 2004 the QE2 sailed from Southampton for Bremerhaven to undergo a refit before taking up her new full time duties as a cruise ship. June 2007 Carnival Corp announced that the QUEEN ELIZABETH 2 had been sold for one hundred million dollars to become a hotel in Dubai, UAE. 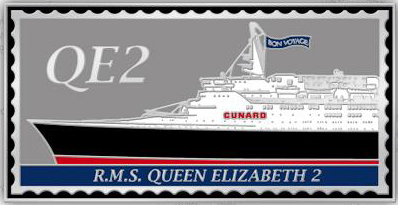 QE2 would make her last voyage for Cunard in November 2008. Commodore R.W. 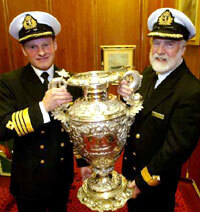 Warwick (right) Master of the QUEEN MARY 2 with the Boston Cup. 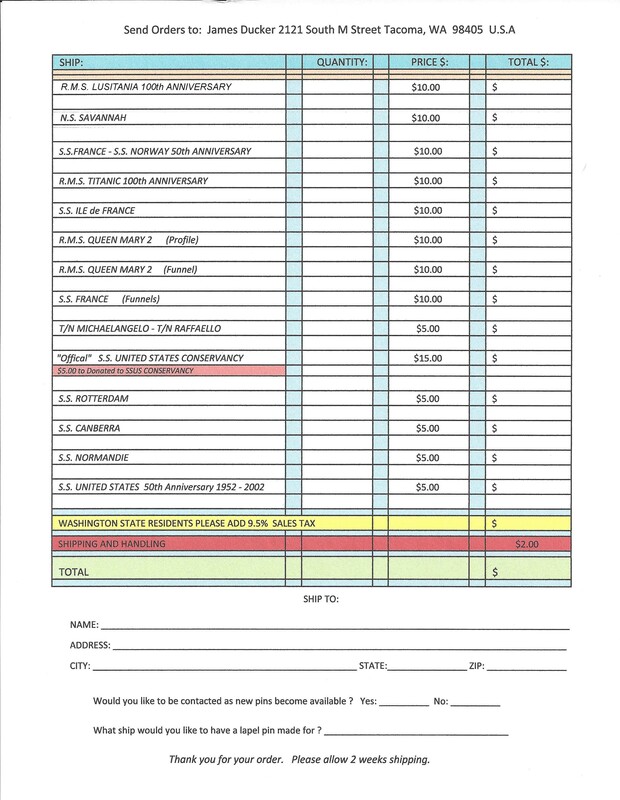 May 1, 2004. "The Most Famous Ship In The World"